To ensure you have the best partner, consider the following habits that separate the expert installers from the amateurs. And, as always, ask for references from past clients who can discuss each of these traits from experience. It shouldn’t be the customer's job to tell the contractor how to do the job. At the beginning of the project, the proposal should include the best options available, even though it may not be something you thought of or necessarily considered part of the project. For example, customers come to AME because it’s our mission to not only meet their goals, but tap into our decades of experience to devise a plan that’s the safest and most time- and cost-efficient. It’s certainly a red flag if your contractor just says “OK” and implements your exact scope of work unless you’re well versed in the execution and have done it before. To complete a successful installation, all parties must agree on a realistic timeline that doesn't compromise safety. Even though we strive to exceed all of our customers’ requests, AME will always default to a timeframe that aligns with accomplishing a job safely. Meaning, just like you cannot fit 10 pounds of sand in a five-pound bag, we won’t rush a two-week project to meet a 10-day expectation. Whoever you work with shouldn’t be overeager to complete the job way before the deadline. It’s also important for the contractor to have a good feel for the site layout, the machines and size of their equipment. When AME installs machines, sometimes they are equivalent to a desk and other times they are the size of Walmart, with thousands of parts that take months to assemble. As a general rule of thumb, whatever the size of a fully assembled machine is, it takes twice that space when it's dismantled to store it. For example, picture your car in the parking lot. It’s likely that everything fits in a 10-by-16 slot. If you were to start dismantling it - the tires, hood, trunk, doors, motor - it'll take two-to-three times that space to layout all of the parts out on the ground. When contractors don’t take that into consideration, it can create a massive logistics problem. Keeping a job site tidy and organized is paramount to any successful installation. Clean installation sites are an indication of the contractors respect for the client’s facility, equipment, and business. If the contractor doesn’t keep everything clean and organized, other teams on site are not only going to be climbing over everything -- they could also experience safety risks. When you hire an industrial contractor, you should feel confident that the team will be properly trained and can handle the scope of work and the associated risks. 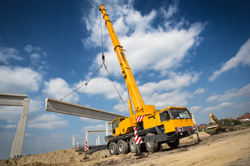 Sure, they know how to erect steel, but if they don't know how to do it safely and use the proper equipment to execute the task, they won’t be a good fit for the job. All it takes is one injury to not only compromise your team but also incur a big cost for the project, and potentially put the client at risk. When AME is on a jobsite installing machinery, we often do the plumbing and electric ourselves, but sometimes it’s outsourced. When all of the trades - electricians, air conditioning pros, painters, etc - are onsite, it’s important to remember that everyone shares a common end-goal and that communication and coordination are essential. Similar to a playground sandbox, your contractors should be able to play fair and work together. Everything may sound perfect when you’re talking to the CEO or supervisor, but what about their onsite team? Will the general contractor’s employees treat your investment, jobsite and machinery as their own? Respect and excellence should be ingrained into the culture at every level of the organization. Hiring an industrial contractor to serve your company’s needs is no easy feat. We hope these tips will make your decision easier during your next mechanical equipment installation project. As a friendly reminder, the company you choose should be able to execute the plan flawlessly and align with your company’s culture and work ethic. Have a question? Need a quote? We’d love to chat or have you stop by our offices to discuss your vision and goals.